Mad Cow Sacred Cow depicts the personal journey of filmmaker Anand Ramayya, a self-professed meat eating Hindu. Ramayya and his crew travel from his in-law's small cattle operation nestled in the heart of the Canadian prairies to the bovine-dodging traffic chaos of India, where the cow is still holding its own as a sacred animal. Clocking in at 53 minutes this tightly edited documentary illustrates the impending plight of both cow and small farmer from opposite sides of the world. Ramayya's connection to both sides of the globe is very personal. His short interviews with Canadian cattle ranchers shows how consolidation in the beef industry is making it difficult for small operators to survive. Small Farm from KarmaFilm on Vimeo. In India Ramayya talks with world-renowned scientist Vandana Shiva about the changing perception of the cow in her country. 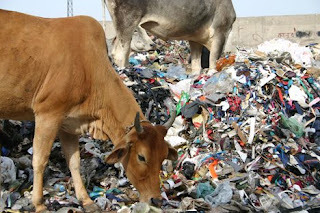 Once revered, the cow is now in danger of losing it's standing, partially due to the industrialization of India's food system. The Cow in India from KarmaFilm on Vimeo. Mad Cow Sacred Cow is worth a look for the personal story as well. Ramayya is a poster boy for a generation of people born to immigrant families in North America, distanced from their ancestral heritage, but increasingly curious about what their parents left behind. Watch the broadcast premiere on CBC Newsworld’s “The Lens” on Feb 3rd, 2009, 10:00 PM EST. Mad Cow Sacred Cow Trailer from KarmaFilm on Vimeo.